Front-end loaders are used to move aggregate from the stockpile into the haul truck. Figure 7-42 shows a typical front-end loader. Loaders, like all equipment, must be in good mechanical condition. There are no particular components or adjustments that inspectors should monitor. More important than the machine itself, is the way it is operated. 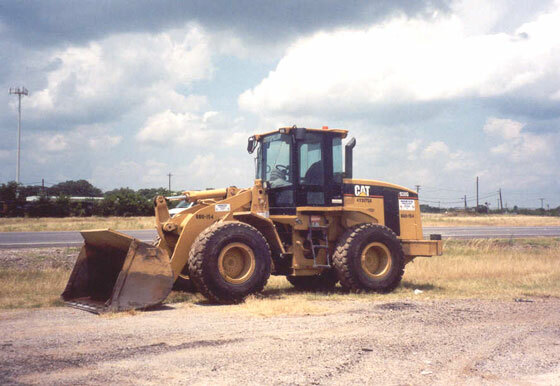 The manufacturer’s name, model number, and serial number of the loader should be recorded in the project folder. There are no stated specifications which must be met, but there should be a record that all equipment used on the project was inspected. The power train, hydraulics, and lift mechanism should be inspected for leaks. The inside of the bucket should be viewed to ensure that it is in good condition and free from any substance which might contaminate the aggregate. A visual check of overall condition should be performed with particular attention given to any potentially harmful or unsafe condition.